Parade route: Outside the San Rafael Canal the parade launches, passing by Marin Yacht Club. The turning basin is in front of San Rafael Yacht Club.San Rafael Canal lights up with nearly 100 boats and yachts illuminating the water with flashing, dancing lights in the shapes of dolphins, buildings and everything under the sun that can be portrayed with small lights. The 5:30 p.m. launch of the parade features a grand entrance with Santa and his reindeer and the San Rafael Police. The parade started as separate celebrations organized by the three major yacht clubs in San Rafael in the 1960s with only a handful (8-10) boats. 8 turned into 80 boats and traffic jammed the highway. Boats often come from Vallejo, Sausalito, Emeryville, Antioch, San Francisco and Bay Area marinas and yacht clubs.Event planners claim this is the third largest Lighted Boat Parade in the country. Action Marine says it is one of the largest boat parades in the Bay Area, which is more likely. Free to see, dress warm and have fun!The annual lighted boat parade in the San Rafael Canal brings together Marin Yacht Club, San Rafael Yacht Club, Loch Lomond Yacht Club and Classic Yacht Association to benefit Community Action Marin, Marin County's oldest and largest provider of family support services. On December 9, starting at 5:30 p.m. the San Rafael Canal lights up with dozens of boats and yachts illuminating the water. Viewing locations include the back of the Montecito Plaza, Beach Park, the San Rafael Yacht Club, Pickleweed Park, and plenty of other good spots along the Canal. This year’s parade is being hosted by the Marin Yacht Club, with viewing along the Canal waterfront. You contact the MYC at 415-453-9366 for additional information. Parade route: Outside the San Rafael Canal the parade launches, passing by Marin Yacht Club. The turning basin is in front of San Rafael Yacht Club. San Rafael Canal lights up with nearly 100 boats and yachts illuminating the water with flashing, dancing lights in the shapes of dolphins, buildings and everything under the sun that can be portrayed with small lights. The 5:30 p.m. launch of the parade features a grand entrance with Santa and his reindeer and the San Rafael Police. The parade started as separate celebrations organized by the three major yacht clubs in San Rafael in the 1960s with only a handful (8-10) boats. 8 turned into 80 boats and traffic jammed the highway. Boats often come from Vallejo, Sausalito, Emeryville, Antioch, San Francisco and Bay Area marinas and yacht clubs. Event planners claim this is the third largest Lighted Boat Parade in the country. Action Marine says it is one of the largest boat parades in the Bay Area, which is more likely. Free to see, dress warm and have fun! 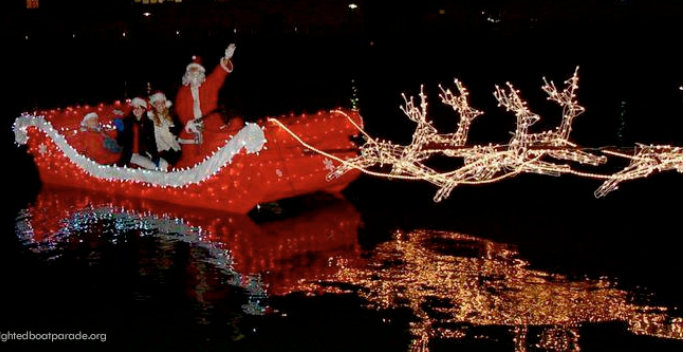 The annual lighted boat parade in the San Rafael Canal brings together Marin Yacht Club, San Rafael Yacht Club, Loch Lomond Yacht Club and Classic Yacht Association to benefit Community Action Marin, Marin County’s oldest and largest provider of family support services.